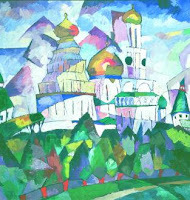 The Russian exhibition called 'Virada Russa' organized at CCBB (Banco do Brasil Cultural Center) focuses its attention on the artistic production created in Russia since the early twentieth century until the 30's, important not only for Russian culture, but for the whole international art on that period. The art works sets a collection that includes production of several important artists of the period, such as Kandinsky, Malevich, Chagall, Rodchenko, Tatlin, Goncharova and many others. All the 123 pieces belongs to the State Museum of St. Petersburg. The exhibition is curated by Yevgenia Petrova, Joseph Kiblitsky, Rodolfo de Athayde and Ania Rodríguez Alonso. Check it out! Where: CCBB, Rua Álvares Penteado, 112 — Centro — São Paulo. On the underground, ground floor, 1st, 2nd and 3th ground. When: September 15th to November 15th, every Tuesday to Sunday, from 10am till 9pm.